PETALUMA, CALIFORNIA, April X, 2016 – Over the last 10 years video walls have become standard in many commercial spaces. 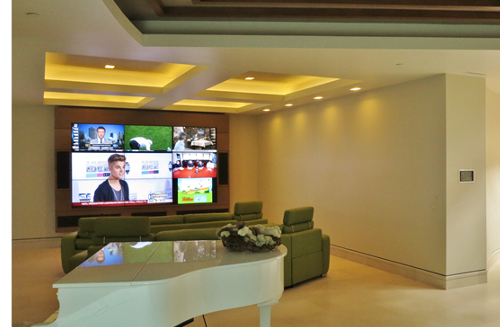 After seeing a video wall in a bar, one Laguna Beach, California, beach-front homeowner took things to the next level by requesting a replica of the wall in his family’s home theater. Matt Kindle, President of local technology integration firm eHome Lifestyle Inc., accepted the challenge without hesitation and began designing the 138-inch display around 10 Sunfire speakers and subwoofers, the logical choice of audio to enhance the massive set-up. To ensure that the theater not only looks great, but is also extremely user-friendly, Kindle built the system around the ELAN Entertainment and Control platform. Kindle pre-programmed the ELAN platform to create unique user settings within the display. “Any family member can watch their designated DirectTV box, Apple TV or Blu-Ray on the big screen,” Kindle said. “We then set it up so that the viewer can easily change between screens. They can watch one thing with all nine screens displaying one large image, or can squeeze the image onto four of the displays, creating a 2x2, 96-inch image.” The other five screens surrounding the compacted main display each have small DirecTV boxes attached to the back, so they can simultaneously play different channels around the compact main display. The home theater is not the only extraordinary aspect of this beachfront home. Kindle also installed a robust A/V systems built around the ELAN Entertainment and Control platform. The system features Vantage lighting control; 12 Aprilaire thermostats; 12 zones of shade control; 17 zones of audio through an ELAN S1616 controller and Niles Audio indoor/outdoor speakers; a GE Concord security system connected to 16 Cameras and 4 Holovision keypads; Pentair Pool and Spa Control; and, of course, theater controls. Through ELAN, wherever the homeowner is in the world, he can monitor and operate each system within the home through the intuitive ELAN App on any mobile device. With the App, the homeowner can even check up on his children to see what they are watching on each of the nine displays in the Sunfire-enhanced theater, while also giving him the ability to remotely change the channel and audio input. Sunfire,from Core Brands, combines unconventional thinking with precision engineering to create innovative home theater products delivering audiophile performance, including the smallest and most powerful subwoofers anywhere. Core Brands combines the technology, product and marketing strengths of iconic and award-winning audio, power management and control brands including ELAN®, SpeakerCraft®, Gefen®, Niles®, Panamax®, Proficient®, Furman®, Sunfire®, BlueBolt® and Xantech® to deliver a portfolio of connected home solutions to its channel partners and end users. For further information, visit www.corebrands.com.